World Language Week Materials are still available for free download. Nebraska celebrated the power of languages throughout World Language Week 2019. Student events provided an opportunity to practice and use German, Spanish, and French. The University of Nebraska Kearney offered a special luncheon as part of its film series UNK@TheWorld. Students who showed distinction in language learning were recognized as World Language Distinguished Scholars. 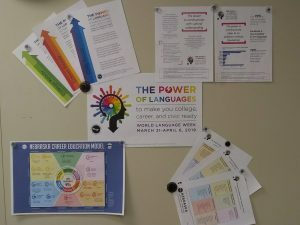 The following materials are still available online as free downloads: Power of Languages posters, Power of Languages stickers, College, career, civic ready posters, Infographics. To see the full biographies of World Language Distinguished Scholars, please visit the online slideshow.